The AP Physics class were assigned a project to build catapults to understand projectile motion more in depth. The original use for catapults was to lay siege to enemy fortifications. Various projectiles were used based on what kind of damage wanted to be done. Large stones were used to break down walls. Diseased bodies were used to destroy kingdoms from the inside. Livestock was even sometimes used; well maybe that last one was just in Monty Python. In any case, none of the projectiles mentioned above were being launched by the AP Physics class. Instead they decided to go with a much safer option: a softball. The assignment given to the students was to build a catapult that could launch a ball at least ten yards. While some shot for the minimum, others pushed their limits, with some flying as far as thirty yards. 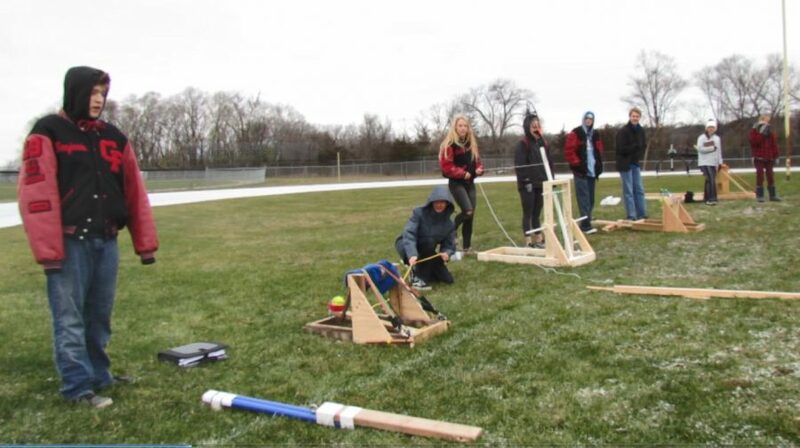 Every group succeeded in meeting the standard, but the true challenge came in the following week, when each team had to find the softball’s projectile motion. One group comprised of Melinda Edstrom and Molly Bowen spent approximately four hours building their catapult. To build their contraption, the team used wood, nails, bungee cords, and a PVC pipe. They were able to get their ball to launch twelve yards, or approximately eleven meters. When asked what her favorite part of the project was, Edstrom responded with “We got to see projectile motion in action, which really helped me understand the topic better.” Overall both parties said that they enjoyed working on the project. Another group made up of Tavian Harrington, Cody Denn, and Ben Gibson took a different approach with their catapult. Using rope, wood, screws, and a bunch of exercise bands, the group assembled their project. A few things made their catapult stand out from the rest, with one aspect being the size of it. Their catapult was one of the smallest catapults out there, but its size didn’t affect the throwing ability of it. The team was able to throw the softball the farthest out of all other groups, reaching nearly forty yards. “It’s a fun tradition that is a great lead into projectile motion” stated Harrington. The whole point of the project is to calculate projectile motion. Instead of giving the students copious amounts of worksheets to get them to understand projectile motion, Mr.Bennett allowed the students’ minds to explore and create true masterpieces. In general it seemed like most of the students enjoyed their time working on this project, even if they weren’t able to launch any livestock.